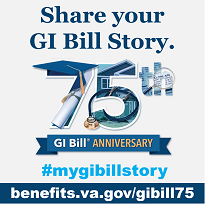 Tell us what the GI Bill means to you as we celebrate the 75th Anniversary of the GI Bill. Submit a complaint if your school or employer is failing to follow the Principles of Excellence. Compare VA-approved institutions and review other information to choose the educational program that works best for you. *A supplemental claim is a re-enrollment or other change that impacts your benefit. Ask us a Question - Get an answer in four to five working days. You can also search for answers to frequently asked questions. This contact method is available worldwide 24 hours a day, seven days a week. Join us on Wednesday, January 30 at 1pm EST. The purpose of the webinar is explain provisions to the Colmery Act and how it impacts you. See our schedule for upcoming webinars. Join us on Wednesday, January 30 at 2pm EST. The purpose of this webinar is to inform the SCOs about provisions to the Colmery Act and how these changes will impact their duties. See our schedule for upcoming webinars. Join us on Thursday, December 27 at 2pm EST. The purpose of this webinar is to inform the SCOs about provisions to the Colmery Act and how these changes will impact their duties. Join us on Thursday, December 27 at 1pm EST. The purpose of the webinar is explain provisions to the Colmery Act and how it impacts you.